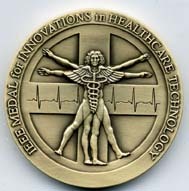 The IEEE Medal for Innovations in Healthcare Technology was established in February, 2009. The IEEE and the IEEE Engineering in Medicine and Biology Society have been involved in the life sciences since 1953; the establishment of this medal will promote IEEE as well as past and future contributions to the life sciences field. Robert S. Langer, 2013, "For pioneering and innovative therapies using micro- and nanoengineering approaches and biomaterial to tissue engineering, drug delivery, and cancer therapeutics." Leroy Hood, 2014, "For pioneering contributions to DNA sequencing technologies that revolutionized life and health sciences." Thomas F. Budinger, 2018, "For pioneering contributions to tomographic radiotracer imaging." This page was last edited on 22 April 2019, at 16:14.